Obersturmbannführer was a paramilitary Nazi Party rank used by both the SA and the SS. It was created in May 1933 to fill the need for an additional rank above Sturmbannführer as the SA expanded. It became an SS rank at the same time. Translated as "senior assault (or storm) unit leader", Obersturmbannführer was junior to Standartenführer and was the equivalent to Oberstleutnant (lieutenant colonel) in the German Army. The insignia for Obersturmbannführer was four silver pips and a stripe, centered on the left collar of an SS/SA uniform. 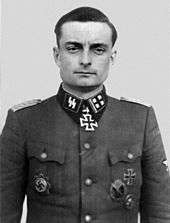 The rank also displayed the shoulder boards of a Wehrmacht Oberstleutnant and was the highest SS/SA rank to display unit insignia on the opposite collar. 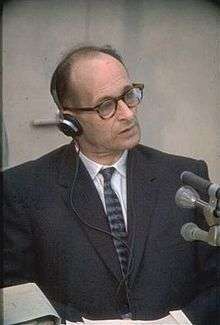 In Eichmann in Jerusalem, Hannah Arendt disputes the notion that Obersturmbannführer was a rank of significance, pointing out that Eichmann spent the war "dreaming" about promotion to Standartenführer. Arendt also points out that "... people like Eichmann, who had risen from the ranks, were never permitted to advance beyond a lieutenant colonel [i.e., the rank of Obersturmbannführer] except at the front." ↑ Yerger 1997, p. 236. ↑ Flaherty 2004, p. 148. ↑ Stein 1984, p. 300 chart. ↑ Arendt 2006, p. 147.